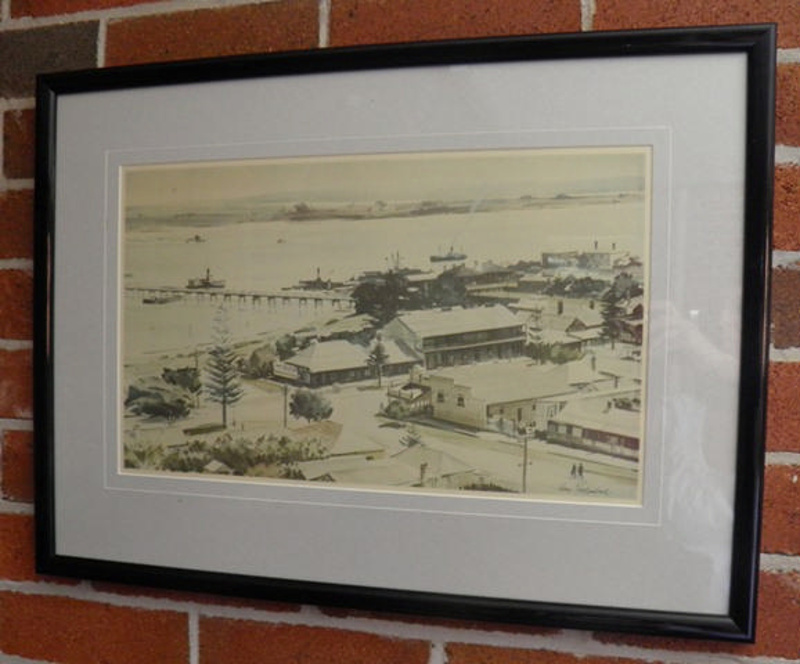 An historic view of Port Macquarie painted in grey and blue tone watercolours on paper by John Percival Parkinson [1921-2003]. The watercolour appears to be painted from an historic photograph used on numerous postcards and in souvenir photograph packs titled 'From the Church Tower'. The photographer is unknown. The photograph was taken from St Thomas' Church tower. The painting features Horton and William Streets, commercial buildings and houses, Kooloonbung Creek, Long Bridge, Hastings River, boats, ships and pine trees. John Parkinson worked as a commercial artist, freelance illustrator and designer before taking up full time painting in 1970. His work is represented in public and private collections across Australia. John Parkinson won over 90 documented art awards and prizes including the Port Macquarie 1000 Art Award (5 times) and the Port Macquarie Heritage Art Award.